(New Britain, Conn., May 21, 2018) – The New Britain Bees today announced the signing of outfielder Matt Tuiasosopo. 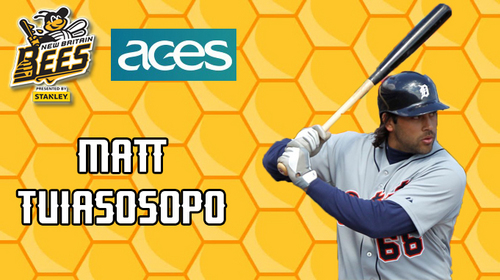 Matt Tuiasosopo joins the Bees for his first season in the Atlantic League and 15th of professional baseball. The former big leaguer spent last year with Triple-A Gwinnett of the Atlanta Braves organization, appearing in 114 games and posting a .207 batting average with eight home runs, 45 RBI, and 51 runs scored. The 32-year-old began his professional career with the Seattle Mariners after being selected in the third round of the 2004 amateur draft. After five successful seasons in the Mariners organization, he made his Major League debut with Seattle in 2008. The slugger spent two more seasons in the big leagues with the Mariners from 2009-10, and also made appearances in the Majors with the Detroit Tigers in 2013 and Braves in 2016. In 155 career big league games, he owns a .206 batting average with 12 home runs, 45 RBI, and 41 runs scored. Over the course of 1,275 career minor league games, Matt has comprised a .251 batting average with 129 home runs, 613 RBI, 710 runs scored, and a .352 on-base percentage. All New Britain Bees transactions are presented by ACES. ACES is dedicated to enhancing and transforming lives through education, innovations, and leadership. Visit https://www.aces.org/ for more information.